This would seem like the most logical reason as I can't see someone going straight from Captain to Admiral without doing something exceptionally important. 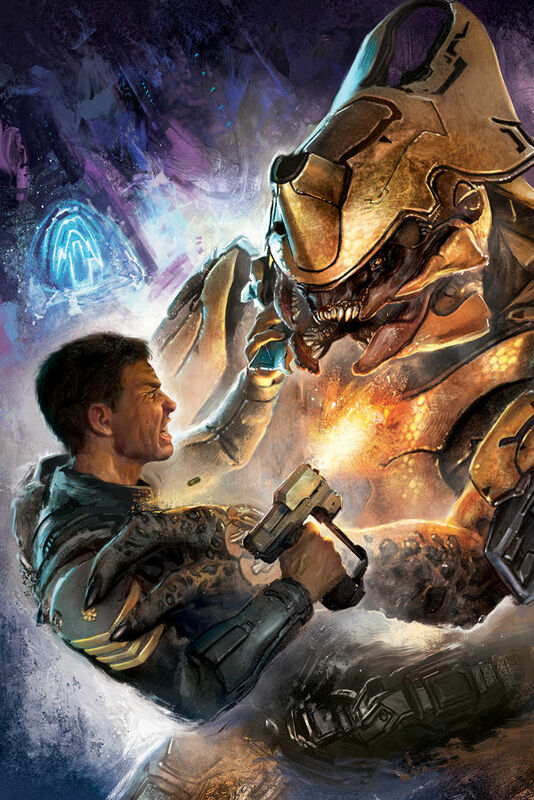 Preventing Jul from acquiring all of that Forerunner technology would be exactly that. More so if they manage to regain both halves of the Janus Key as well. Well it is stated that Margaret Parangosky and Terrance Hood is fond of Thomas Lasky... in the way of a future leader, much like Serin Osman. Plus Thomas Lasky easily demonstrated his loyalty to not only the UNSC but also Lord Terrance Hood. I still wouldn't see him skipping all those ranks to go straight to Admiral. Honestly, being Hoods successor-in-training would make the most sense. Wasn't Osman a captain before she was promoted to Admiral and subsequent head of ONI? 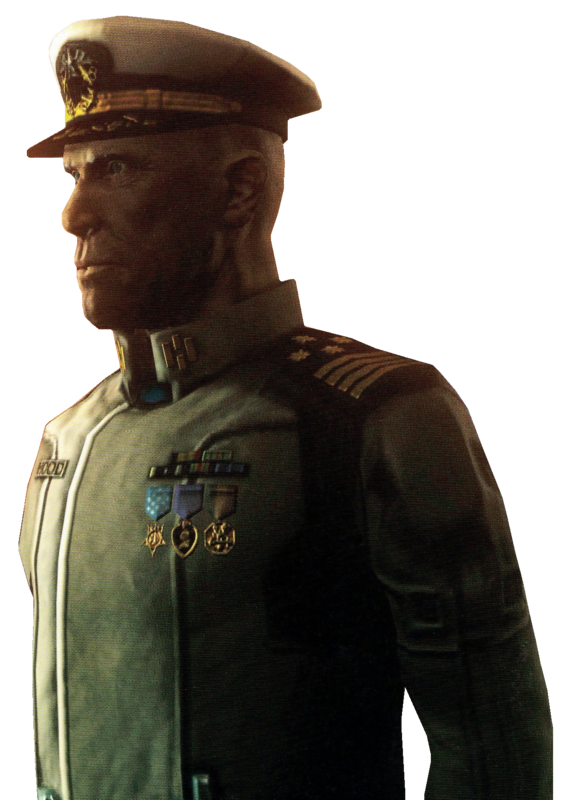 I would not be surprised if Lasky did attain the rank of Admiral through his recent accomplishments. If you take a look at his uniform in the Halo 5 Vidoc you'll notice that he now has 4 stars compared to the one star he had in Halo 4. His shoulder pad is also gone. 4 stars would indicate he's now an Admiral instead of a Captain. 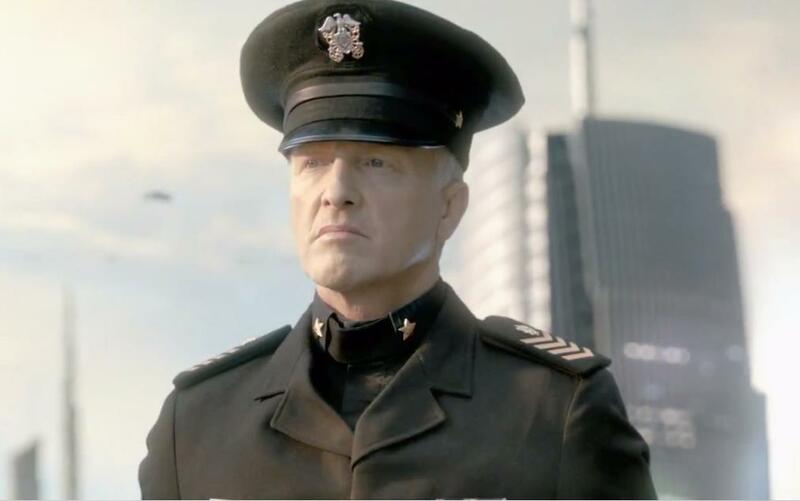 I wonder how he got promoted so quickly seeing as in Halo 4 he was just a Commander (Captain by the time of Spartan Ops) and now he's an Admiral by the look of it. I mean that means he skipped 3 ranks in not even 2 years. That's pretty unprecedented. Thats not a star in Halo 4. That's the insignia for an O-4 officer... Wait, what? 4 stripes indicates a Captain not a Admiral. The lowest rank of Admirals has a star. When he was a Commander he had 3 stripes. Halo 5: Guardians - In Game how does buck sit on nothing? It was only matter of time. 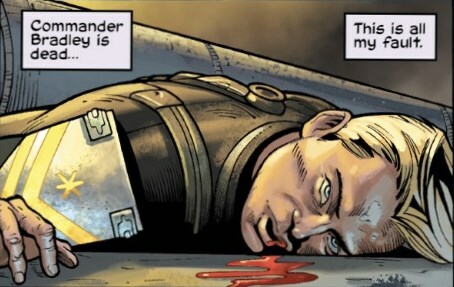 Parangosky when talking about Del Rio said he would be given the Infinity despite the rank, because there weren't lots of higher ranked officers in the post war Navy (and because rank doesn't matter so much as an indication in her opinion). 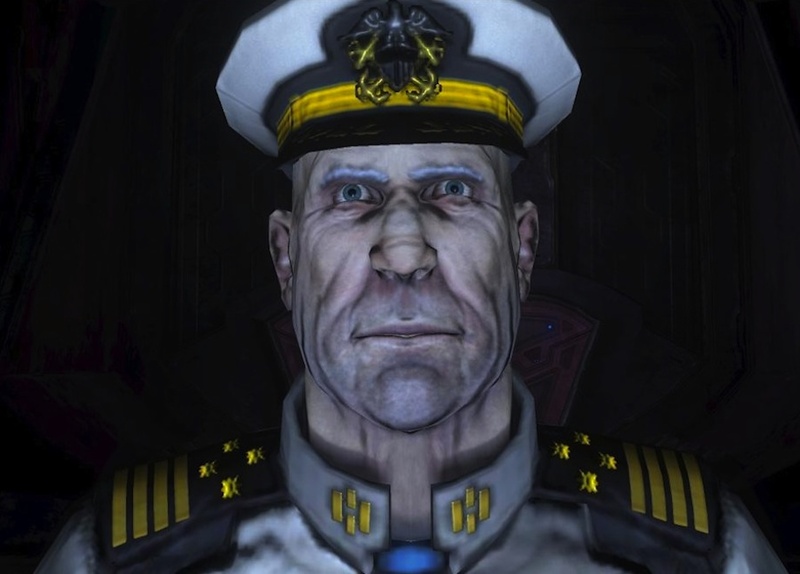 Infinity is a flagship, it should be led by an admiral. 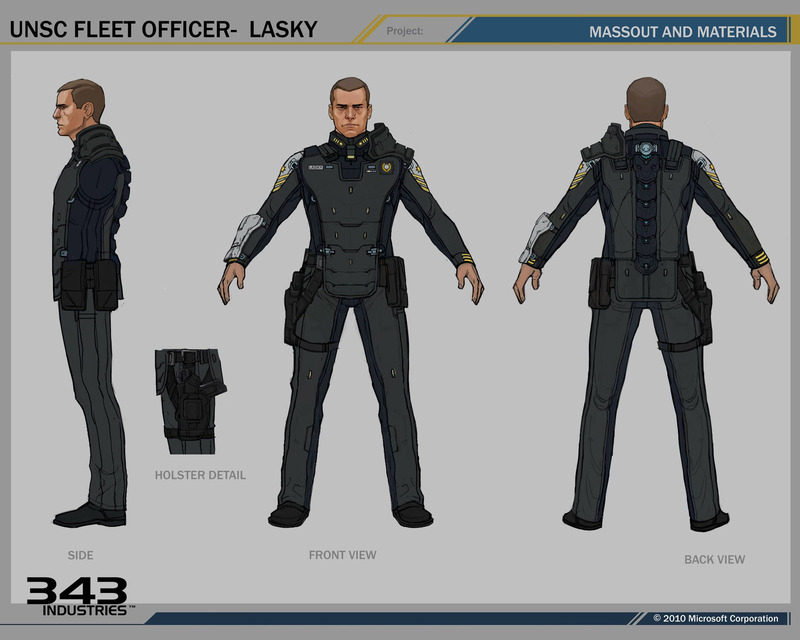 And about Lasky, for what we have seen since now, he was nearer to be demoted and removed from command than promoted, so maybe escalation will show some consistent success. 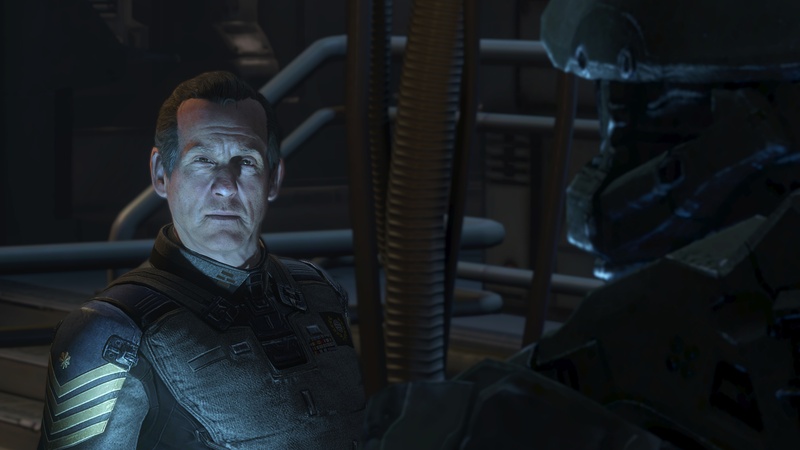 Thomas Lasky was promoted to Captain of the UNSC Infinity, for a good six months, at least, prior to the events occurring in Halo: Escalation... 13 - 14 months post Halo: Escalation. If a person shows merits of courage, leadership, loyalty, diligence, endurance... they are easily on the grounds for a promotion. It should be noted that Terrence Hood is now 68 years of age and possibly paraplegic, post Operation: ATHENA, and so perhaps he has taken up a more passive role behind a desk, which would require a representative ambassador to perform diplomatic solutions with the Sangheili and possibly other client species? In response to the point that he just skipped two rate tiers: welcome to science fiction Captain Lennox from transformers in like two years gets to Colonel skipping like two or three ranks in-between also I mean given the fact that High Command has in put into the list it wouldn't be absurd that he would be shuffled up to Admiral given that fact that Harper doesn't seem to be the brightest Commissioned Officer in the world and Hood is probably thinking of throwing in the towel by this point (or dying from age either way) and also I don't know what I think about that shoulder plating I liked the asymmetry (I have no idea why because usually I'm really OCD about symmetry) and I mean the shoulder brace does go up to the neck and maybe ambushes are statistically more frequently to the left of personnel? I don't know but I wouldn't put it past the UNSC given they lowered the Ammunition count of the MA5 series due to statistical jamming rates. 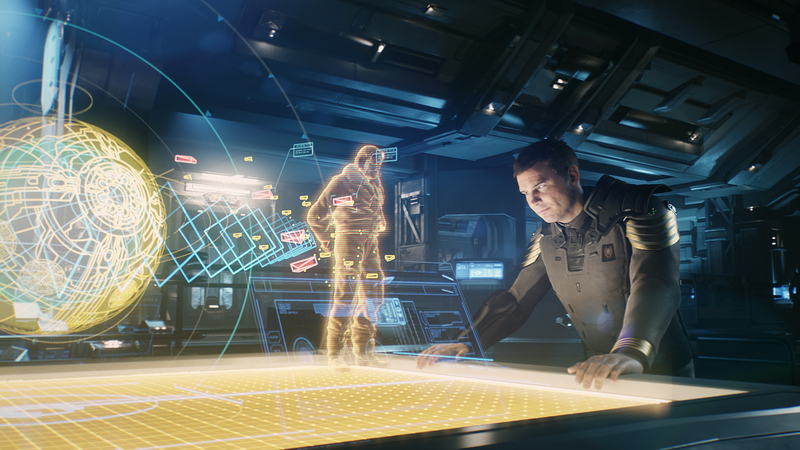 There is a shortage of commissioned and experience officers in the United Nations Space Command during the post war efforts... the Admirals are reaching peak age. ...and all I noticed was Buck getting in some excellent exercise with that invisible box squat. 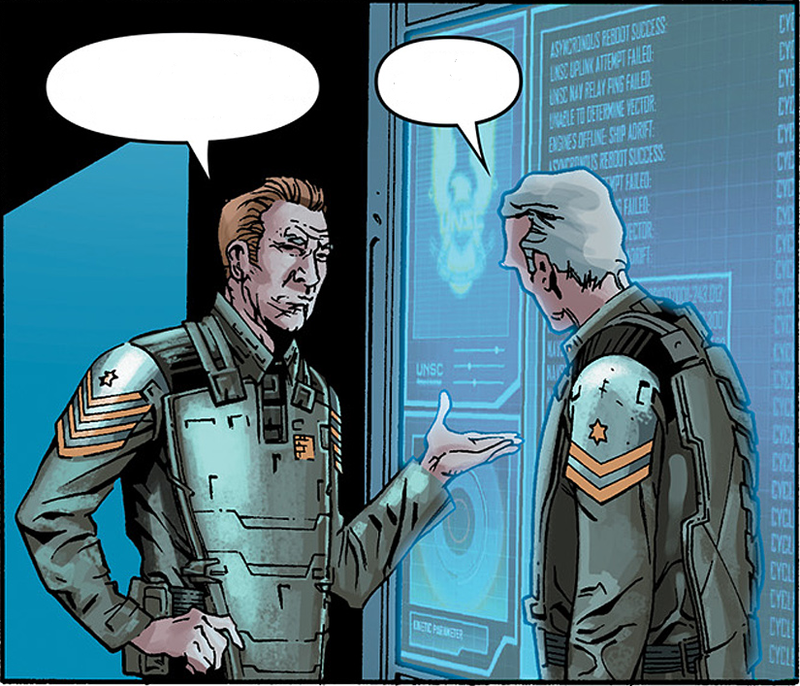 We can infer that Lasky's handling of Operation: ATHENA (Halo: Escalation, issue 19, is the most current event in Halo Universe thus far, 09/17/2558) impressed the UNSC brass enough to have him promoted to Admiral by the time H5G rolls around... Given that the operation involves the Absolute Record (and assuming it was a success), his promotion really shouldn't be all that surprising. I'm not gonna say anything about the rank, but the visuals in the Halo 5 screenshot. With you noting that his shoulder guard thing is gone, I picked apart this image yesterday because someone pointed out that Buck is actually sitting on nothing. It appears to be an unfinished scene with lighting missing from this shot and the textures on the Mantis being such a low resolution this to me looks almost like either early story boarding or just unfinished. So I'd probably chock up his shoulder pad missing either it being not placed on him in this shot or they actually did remove it. Well it's not on him in this shot either, which is from the E3 trailer and that seemed to be more complete footage. He looks a hell of a lot better without it IMO. I don't see what the purpose of it even was. It wouldn't be surprising for body armor to become part of a normal uniform in the UNSC given the Human-Covenant war. Though aesthetically I think the idea is that Humanity is beginning to resemble their original space-faring civilization as part of the Reclamation geas implanted in modern Humans by the Libriarian.